On the 8th Day of Christmas….. This is What’s on Sale!!!!! Sale Price $395.00!!!! On the 7th Day of Christmas…….. This is What’s on Sale!!!!! On the 6th Day of Christmas……..This is what’s on Sale!!!! On the 6th Day of Christmas…… I know my days don’t match up. Due to a very hectic schedule I am trying to play catch up here on my sale days. Finally got the last of my Christmas finished doll orders completed and shipped so am hoping to get to where I should be with my sales. My 6th day sale is this lovely little Sonneburg Child Bleuette “Friend”. 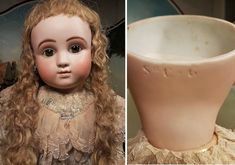 She is regularly $295.00 as an undressed doll and $350.00 as a dressed doll. 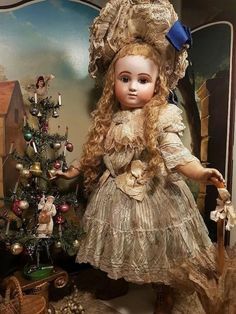 From now until midnight Christmas night, December 25th she is on sale for $275.00 as an undressed doll and $325.00 as a dressed doll. Save $25.00! Shipping to continental U.S. is $15.00. International shipping is available. Only one is available! Please email me at landofozdolls@mchsi.com if you are interested in purchasing. She will return to her regular price on the 26th! Merry Christmas!!!! On the 5th Day of Christmas…… This is what’s on Sale: 24 Hours Only!!!! 23″ Dressed Bru 11 by Connie Zink. ( Only one available) This stunning Bru 11 is on the FB19S composition body from NYDP. 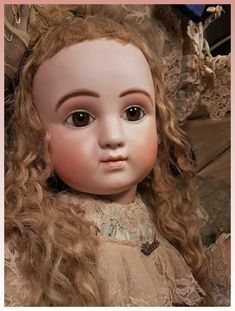 She has light blue English paperweight eyes and a beautiful light blonde mohair wig. Her costume and leather shoes were made by Pam Willits. She has cotton crocheted stockings. (Shoes will come with ribbon ties, I didn’t have time to get them in the photo.) She will be listed on Ebay this weekend for $595.00 plus shipping. 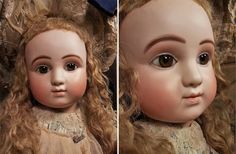 You can purchase her right now for $495.00 plus $35.00 shipping to continental U.S. (International shipping is available and can be figured upon request). Please email me at landofozdolls@mchsi.com to purchase.Sale ends Midnight December 19th, 2014! On the 3rd Day of Christmas….. Sale (24 Hour Sale Only!!!!!!) Only One Available!!! On the 3rd Day of Christmas…… this is what’s on sale! 24 Hours Only and then she will return to her regular price!!!! Sale ends at 9:00PM Central Time Wednesday Night, December 17th! This 20″ undressed Mlle. Florence on the FLB16S composition body has a beautiful mohair wig. 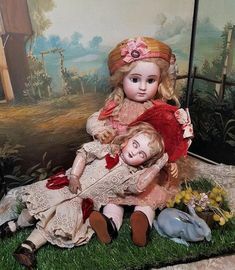 Her complete description is here on the website and can be found on her catalog page: https://landofozdolls.net/dolls-for-sale/20-mlle-florence-2/ Her regular price $475.00 and $30.00 shipping. For 24 hours only, (SAVE $100.00), she will be on sale for $375.00 plus $30.00 shipping to continental U.S. Shipping costs can be figured upon request for international shipping. Please email me at landofozdolls@mchsi.com if you are interested in purchasing Mlle. Florence at the special price of $100.00 off. ($375.00). Merry Christmas!!! Don’t forget this sale is good for 24 Hours ONLY!!! On the 2nd Day of Christmas……… Sale!! On the 2nd Day of Christmas…….